Just got a flicker of net access, and wanted to assure you that I am fine, as are all of my teammates. I was at Camp 2 (21,300 feet) when the quake struck, and we were just fine up there. It was a kind of torture being so high up, thus unable to descend quickly to assist at EBC where the impact was greatest. My thoughts are with those lost, not only on E but throughout this beautiful country. Our summit aspirations have ended, but our dedication to Nepal is strong. We will start walking out tomorrow, eager to assist wherever possible. Net infrastructure is shattered, and I anticipate no more posts for at least a week. THANK YOU for your kindness and support and interest. I look forward to communicating with each of you individually once I am able to do so. 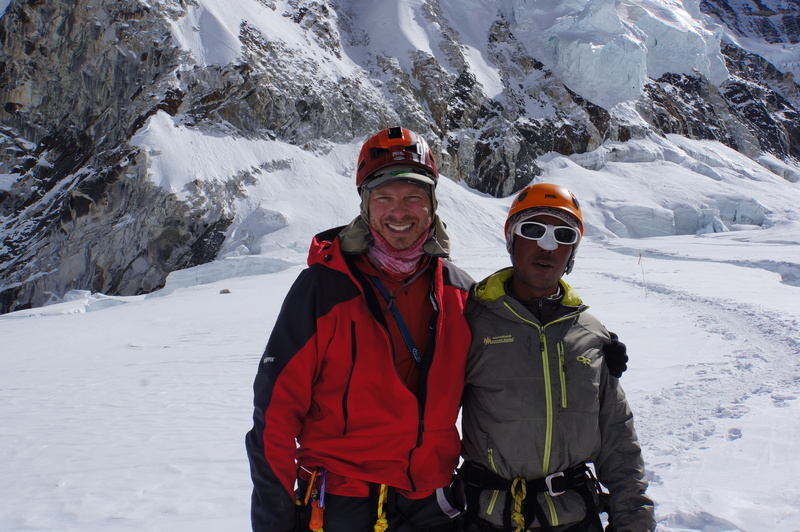 Hi Paul….so grateful that you and your teammates are well and all ok. Have been thinking and keeping you and all the people of Nepal in my prayers. Blessings and safe journey back. Paul, best wishes for a safe descent from EBC. I know you will offer her help to those affected as you make it back to Lukla and KTM. Take care! Relieved to hear you and the rest of the IMG team are OK! p2, we all knew it would be killing you to be stuck at Camp 2 unable to descend and help. I’m sure I’m not alone in admitting a bit of relief in knowing you had to stay put for a while, though. As you walk out there will be all kinds of ways to assist. Do your thing, brother. Stay safe. Hi Paul – You have been in our thoughts and prayers constantly since we heard about the events unfolding in Nepal. Stay safe on the way back. I know that you will be assisting others, as always! All of us here in Seattle pulling for you, and sending you love. Knowing that your steady energy and excellent mind can be of help to the people of Nepal. Come home safely! Paul, So glad to hear that you and your team are safe. Our collective Seattle thoughts are with those that suffered from the earthquake in Nepal. All from the EA DTMH Class of 2014 glad to hear that your safe. Thoughts are with you as you descend and assist those you can. Proud to have been taught by such an amazing group of legends. Great to see your are safe P2. Stay safe on trip back.